ASHEVILLE, NC – Local artist and activist, Katie Kasben, will be traveling to Australia in August to begin researching the possibility of a cultural exchange program between Aboriginal Australians and Native Americans. While there she will attend the GARMA Festival in the Northern Territory of Australia, which is a festival of traditional Aboriginal culture. As a former instructor for the National Young Leaders Conference in DC and the VIP coordinator for the Asheville HATCH festival, Kasben has been invited to attend the “Key Forum” on Creative Industries at GARMA, which is the 2009 theme for the festival. 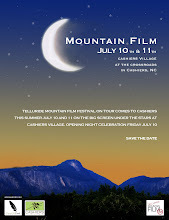 CASHIERS, NC – Telluride Mountain Film Festival comes to Western North Carolina for the first time Friday July 10th and Saturday July 11th, 2009. The two evenings will feature delicious food from local restaurants and live music under the stars at Cashiers Village Hillside Park, up the hill behind Tommy’s. The festival will open Friday July 10th with a special presentation of The Village Heritage Award by Cashiers Historical Society. This will be followed by the flamenco/jazz/world music of Asheville-based Cabo Verde. Dinner will then be served, courtesy of Cyprus International Cuisine of Highlands. There will be a Q & A with director Matt Morris after the screening of his film "History Making Farming Author on the Move." The evening features a selection of outdoor, adventure, human interest and environmental films from Telluride Mountain Film Festival. Saturday July 11th will be a casual evening enjoying the music of The Trainwreks, voted Western North Carolina’s number one Alternative-Country band by Mountain Xpress. Dinner will be the delicious appetizers, sandwiches, and pastas of Sapphire Mountain Brewing Company. Special guests from Drexel, NC featured in the film Pickin’ & Trimmin’ will play their down home bluegrass music before intermission. The evening features a selection of outdoor, adventure, human interest and environmental films from Telluride Mountain Film Festival (films are different Friday night and Saturday). Both nights, guests will have two free drinks (that are included with ticket) and can be treated to the fine North Carolina wines of Westbend Vineyards and have the opportunity to meet the owner and wine maker. We are pleased to offer the refreshing micro-brewed beers of Sapphire Mountain Brewing Company as well. Gates open at 6pm both nights. Arrive early to find good parking, and enjoy all the evening has to offer. Two drinks (wine, beer or soda) are included with ticket and more can be purchased. Music starts around 6pm and dinner (included with ticket) is served at 7pm. The Telluride Film Festival begins at dusk both nights (around 9pm) and will conclude about 11pm. A different selection of films will be shown each night. Sorry, no pets or outside food and drink are permitted. Tickets are $45 for one night, $80 for a two night pass. Admission price includes two beverages, films, live music, dinner, and a lanyard with your Film Pass, a flashlight and coupons to local businesses! The gates open at 8pm for film-only ticket holders. WNC magazine will be offering prizes and giveaways. Proceeds will benefit Summit Charter School of Cashiers. The event is hosted by Cashiers Village, located near where Highways 64 and 107 meet, home to Zeke & Earl’s hot dog stand and the legendary Tommy’s Coffee Shop. Cashiers Village has plans for a pedestrian friendly residential and retail community at the Cashiers Crossroads which will begin development in earnest as the economy rights itself. Their vision is to create a thriving and culturally enriching town center. ASHEVILLE, NC – The Fly Fishing Film Tour, a traveling collection of fly fishing movies that aim to inspire anglers with quality films in a theater environment, comes to Asheville on Friday. The tour focuses on both freshwater and saltwater film shorts, with much of the proceeds going to local and national conservation groups. This film consists of seven segments showcasing fly fishing around the world. Doors open at 6 p.m. Friday at the Asheville Community Theater. Show time is 7:30 p.m.
• Appalachian Angler in Boone, 963-8383. • Curtis Wright Outfitters in Weaverville, Saluda and Biltmore Village, 645-8700. • Headwaters Outfitters in Rosman, 877-3106. • Hunter Banks Co., Asheville, 252-3005 or 800-227-6732. • One Fly Outfitters, Black Mountain, 669-6939. • Rivers Edge outfitters, Spruce Pine, 765-3474. • Waynesville Fly Shop, 246-0306. For more information, visit www.ashevilleflyfishingfilm.com. Everyone has an opinion about the movies they’ve seen. Have you ever wondered why only professional reviewers get to give their opinion? It turns out that ashevilleNC.com is trying to change that, and gives users a chance to review and rate every movie no matter what the critics say. The web-site has also launched its revolutionary new Movie Previews section, and it’s fast. All you have to do is select the movie’s preview link, causing the preview to load and start playing instantly. No more waiting for the video to download! Even if you just want to know what films are playing or would like local theater show times, ashevilleNC.com has listings for all of the Asheville area theaters. Interested? AshevilleNC.com’s Movies Section awaits.